The holiday season is officially upon us, and this is my ultimate guide to an eco friendly and zero waste Christmas. We’re going to go over everything… even the most heated debate of whether or not a real tree is more sustainable than a fake tree. We’ll be covering ethical and sustainable party dresses, gifting, gift wrapping, even receiving gifts, and of course a Christmas guide wouldn’t be complete without talking about a few family traditions and food! For me the holiday season kicks off with Thanksgiving. Every Thanksgiving morning, I wake up to watch the parade. Mostly because I love musical theatre and like getting to see the broadway numbers at the beginning…. but watching the parade led by Tom Turkey and ending with Santa on his sleigh always gets me a little emotional. Maybe it’s because it was a tradition I shared with my grandmother or maybe it’s just because I’m a nostalgic sap, but it’s like I officially get permission to decorate the tree and put on the Christmas music. I have found so much joy in Christmas these past few years, but this year especially. Last year, when we lived in the tiny home, there wasn’t any room to decorate and I was sad without a tree. We didn’t go overboard this year, but we’ve hung a wreath, put up a tiny tree, and festively hung the stockings above the fireplace with care. I also worked part time at a UPS Store over the holidays season. Have you ever been to a UPS store the week before Christmas? It’s a MAD HOUSE. And, let me tell you after a week of that - you are OVER the holiday season. Thankfully, I’m no longer singing Christmas carols for a quarter of the year and don’t have to deal with grumpy people at the UPS store. Let’s start off with the decor. The day after Thanksgiving while most of America is in a tizzy snapping up the latest deal, I’m at home in snuggly clothing listening to my favorite Bing Crosby Christmas record and breaking out every penguin stuffed animal I own. My favorite animal is a penguin. And, the thing about having a favorite ‘anything’ is that people will start buying you gifts of said ‘favorite thing’. So, I have a massed a penguin stuffed animal collection and instead of making them dog toys, I use them as my very festive Christmas decorations, and I think that’s just perfect! Bottom line for this section, is use what you have. I was very excited to visit a Christmas tree farm for the first time! All of the trees were gorgeous. There’s been a huge debate over whether a real tree is more sustainable than a fake tree, and I believe that a real tree is more sustainable IF they’re composted at the end of their lives. Christmas tree farms grow trees all year round which absorb carbon throughout the year! YAY! Just make sure that you compost them so they’re turned back into a nutrient rich soil. If your only option is to dump your tree at the landfill, then consider opting for a fake Christmas tree or check out some non-tree ideas like this tree made from sticks and twine! Of course, if you already have a fake Christmas tree then use it as long as possible. There’s no need to throw it out in lieu of a real one. I really like this article by the New York Times. It brings up lots of good points but my favorite is the last one which says, we’re arguing over which tree is better when we should really be worried about the flight emissions. Some people abhor decorating, but I rather enjoy it. My home certainly isn’t going to win any awards for perfectly curated decoration. I keep it simply, but it’s something that I love doing. I have a small fake Christmas tree that I picked up secondhand at the local thrift store several years ago, and a real Christmas tree that I got from the farm this year. Both are decorated with found items, and decor we already had. We don’t go out of the way to buy new decorations, but prefer to keep it simple. I love using found and kitchen objects for around the house like using cinnamon sticks, red leaves from fallen trees, stringing together popcorn strands, and even making an advent calendar out of an old shipping sleeve. Let me know, if you’d like to see a tutorial on any of those! I also strung my tiny tree with a homemade wine cork garland. Something, I’ve always wanted to make! Our stockings and tree skirt have been passed down from my family. The Had everyone’s name embroidered into them, so I seam ripped my mom and dad’s name and replaced it with Justin and Nala. Now we have very festive, vintage, and hand quilted items to hand in our home. Asking friends and family if they have an excess amount of ornaments or Christmas decorations is a great way to accumulate a few festive pieces. I find that most people have an overwhelming amount of decor (My grandma is always trying to give decor away) - all you have to do is ask! Gifts can be kind of tricky. I see value in buying something someone needs or wants, but I also see value in buying experiences because maybe someone doesn’t need or want anything. I think the most important take away from this section is have conversations and truly find out what someone wants before buying anything! I’m also running a series on my YouTube channel all about easy, last-minute zero waste DIY gifts that you can whip up in only a few minutes. Check out the first in this series! This year, as we put up the tree, I was so happy and inspired to come up with 50+ ethical gift ideas for everyone on your list! Last year, I created massive gift guides for experience gifts and consumable gifts. But this year, I wanted to create gift guides that highlight some really awesome ethical brands. Some people are a little confused as to why I don’t advocate for 100% second hand, but I personally don’t think that’s sustainable for the long term, and I like to see a healthy mix of both. If all of the people who believe in sustainability refused to buy from sustainable brands, what kind of message does that send to the market? I’m personally all about a healthy mix of giving someone what they want and also giving experience and consumable gifts! Basically have a conversation with someone about they want and how you can add value to their life. One of my favorite gifts that I’ve been giving to family recently, is donating to an organization close to their heart in their honor. It’s been received exceedingly well! So, if you’re a little stumped on what to give someone, I would give them a card and donate to a great cause. If you’re gifting for an acquaintance I think that a nice gift would be these cards from Arbor Day where each card plants a tree - how cool is that!? I also think a great gift idea is to give gifts that encourage eco-friendly living. Maybe your mom might use less plastic wrap if you gave her some beeswax wraps. Maybe your roommate would refuse the straw if she had a sleek glass straw to carry around. Maybe your dad would use fewer takeaway coffee cups if he had a nice thermos? Looking for more inspo? Take a peak at the shop tab on my blog. I’m sure some of us have received less than stellar gifts in our lifetime? The thing is… most people don’t want to give a bad gift. Where the disconnect is, is the lack of communication. My recommendation is always for making a list! 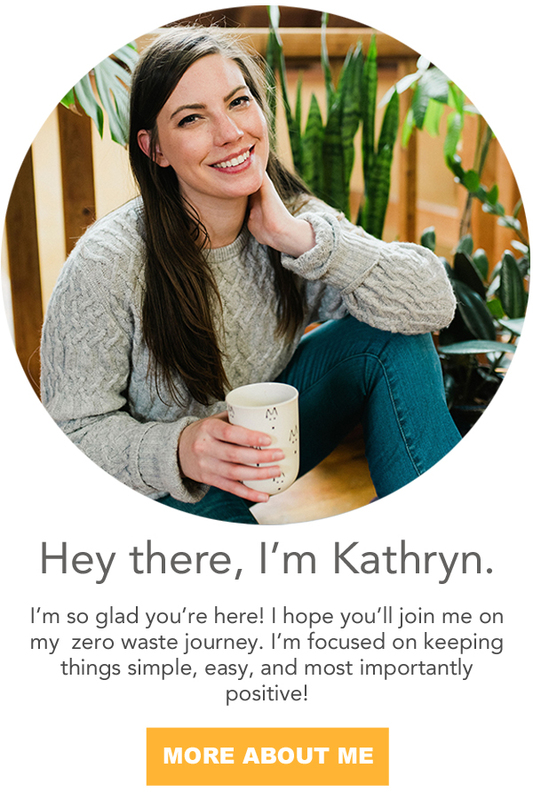 I wrote a full guide on the best way to go about this called The Zero Waste Guide for RECEIVING Gifts. I think you’ll find it really helpful, in getting gifts you want and align with your values. Once you have the perfect gift picked out, what comes next? The wrapping of course! Did you know that most wrapping paper isn’t recyclable? And, after tearing through all of it, it’s probably not reusable either. In order to prevent this, stick to gift wrapping that can be used over and over like holiday bags and tissue paper or the beautiful cloth alternatives. Or you could also go for a double gift and make the wrapping part of the present. I wrote an entire guide for wrapping beautiful holiday presents and ways to upcycle your holiday cards from the year before. Be sure to check it out. Can you believe we’re only half way through this guide!? When I said Ultimate… I meant ULTIMATE. One of my favorite parts about the season is all of the family traditions passed down. As a family we didn’t have a ton of traditions, but one of my favorites was always going to look at the lights the night before Christmas Eve and sipping homemade cocoa. We would also always make the classic Christmas sugar cookies complete with red and bright green frosting. When switching to a zero waste lifestyle, I’ve had some traditions that work and some that don’t. I wrote about my failed attempt at zero waste-ifying a king cake. However, I’ve had a lot more success with creating delicious and colorful sugar cookies with natural food coloring! Also, check out these amazing candy cane cookies! I love being able to use natural food dye from things around my kitchen instead of those tiny plastic bottles filled with synthetic dyes. Maybe see if there’s a few family traditions you can do while creating a little bit of less waste. I personally opted for the homemade advent calendar that’s full of things to do instead of small items. If you’re looking for inspo Reading My Tea Leaves has been doing this for a long time. I have definitely noticed, that I’ve tended to simplify some of my traditions. I don’t think it makes them any less special, it just makes them more intentional. This post does a great job of talking about simplifying during these busy times. When it comes to buying the food, be sure to check out my Guide to Zero Waste Grocery Shopping. When it comes to food waste, I created a great guide full of creative ways to use up your holiday leftovers. But, sometimes, the food is just pass it’s prime. If that’s the case then don’t toss it in the landfill - compost it! I have great guides on composting in your backyard and composting if you live in an apartment. Now, if you’re planning food for a crowd, then be sure to check out the next section all about parties… my fav. You know me, I LOVE a good party, and I especially love throwing them. On Thursday, I’ll be sharing my lust worthy ethical and sustainable holiday dress guide with dresses perfect for your office party down to ringing in the new year so stay tuned for that. 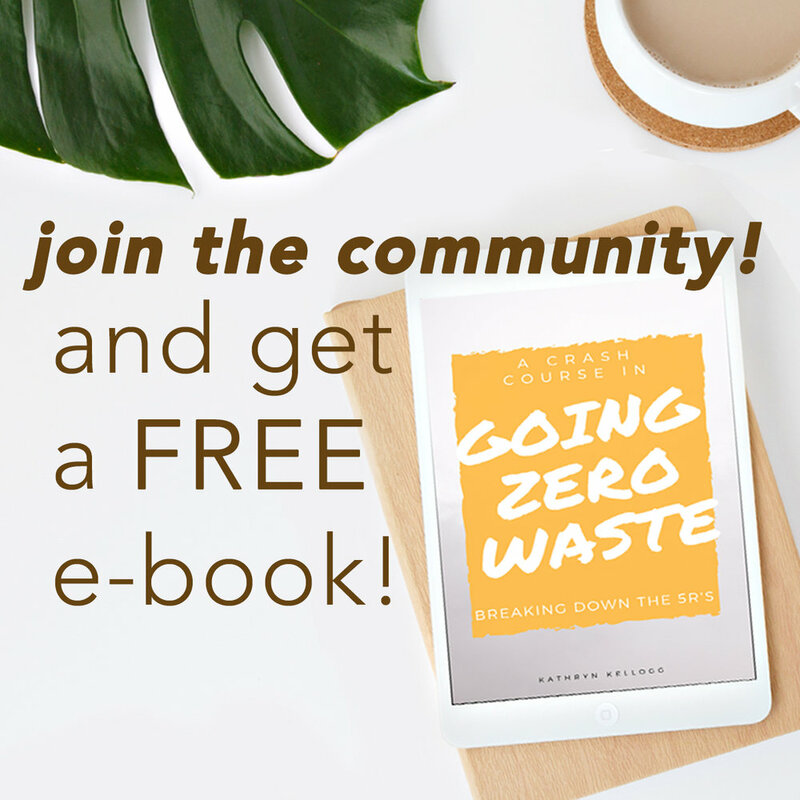 Here’s my top five tips for throwing a zero waste party and my tips for staying zero waste at a non-zero waste party. It might be kind of weird at first to bring your own cup to a party, but I do it all the time and have had nothing but positive responses. But, the one thing I always do when I show up to a party is come with a gift. I think bringing a hostess gift is always so classy. These are my favorite zero waste hostess gifts. During the holidays, I find that lots of parties include the white elephant party game - which means you’re most likely to wind up going home with something that you don’t want. If you can help plan this party, maybe suggest doing a cookie swap instead? That the gift should be consumable? Or that the gifts be donations towards charity instead? If you can’t get away from it, I would probably bring a small item like reusable straws, neutral tea towels, nice handkerchiefs, or a thermos. I’d try to opt for something that helps to reduce the receivers waste.